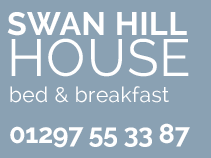 Swan Hill House confirms all bookings by email (or letter). Bookings on the day of arrival may not receive a confirmation, only verbally. All cancellations should be in writing. Your deposit secures your booking and is non refundable (under any circumstances). It can be used against a future booking (within a set time period) if you wish to move dates. For bookings of only a one night stay a 50% deposit of the total cost is required. For stays of 2 nights or more a deposit representing the cost of one night is required. Unfortunately guests sometimes need to cancel their booking for various reasons however the guest house should not have to suffer the loss. When you make your booking and we have taken your debit / credit card number to secure the booking , a legally binding contract exists between us that is non-cancellable and non refundable, except in exceptional circumstances. You may still remain liable to pay in full or part for the booking, even if you are unable to take your holiday. Even where you have not paid in full at the time of cancellation, you will remain liable for the full cost. If for some reason you do need to cancel, it is important that you tell us at the first opportunity so that we may attempt to re-let your room and minimise your loss. If we do re-let your room you are no longer liable for the cost. Bookings cancelled seven days or less prior to arrival will be charged the full cost of the booking. Bookings cancelled between 8 to 14 days will be charged 50% of the total cost of the booking. Cancellation insurance is relatively inexpensive and we would recommend you take this out prior to your visit to protect yourself against any possible loss. Please take care when staying at Swan Hill House. You are responsible and liable for any breakages or damages, which you may cause, to the accommodation or its contents. All we ask is that you report any incidents as they occur. We do not normally charge for minor breakages but we may send you an invoice for repair or making good if the damage or breakage is significant. Any data collected during the course of the booking will be stored on our computer. We will not share your details with any third party. Guests are invited to arrive between 4pm and 7pm. If you are going to arrive later than 7pm please advise us at the time of booking of an estimated time of arrival. Sorry, we do not allow pets at this property. Sorry, no children under the age of twelve are allowed at this property. Breakfast is served between 8am and 9am, earlier if requested. We have a shared driveway at the side of the house leading to a large (ish) gravel car park at the rear of the house. Cars are parked at the owners risk and we do not accept responsibility for valuable items left in the car. Please note that smoking is not allowed throughout the building. See our current reservations online and make a booking. Using Caterbook you can check the availability for any of our modern furnished rooms. Hidden in the picturesque village of Colyford in the south west, bordering on Dorset.